A naive college student named Charles (Gerard Blain) comes to live with his sophisticated cousin Paul (Jean-Claude Brialy) in Paris, and falls in love with the beautiful yet emotionally unavailable Florence (Juliette Mayniel). I agree with Peary that it’s difficult to feel much attachment towards the characters in this bleak yet innovative New Wave film. Part of the problem is that it takes too long for things to get rolling, given that the first half-hour or so is devoted simply to showing Charles’s initiation into the wild student life of partying, bar-hopping, playing cards, and sleeping around. Then, once the plot finally begins to develop some steam, we must watch in frustration as hapless Charles falls head-over-heels in love with the beautiful Florence, only to have her stolen from right under his nose by Paul. Indeed, Paul — with his devilish goatee and cavalier arrogance — is utterly unappealing, and is a large part of what made this movie rather unpleasant for me. What is ultimately more interesting than either the plot or the characters, however, is director Claude Chabrol’s palette of filmic techniques, which include (as Peary points out) strategic character placement and an “inventive use of foreground and background”. It’s an impressive display of experimentation, and makes the film a treat for the eyes if not for the heart. Yes. As a forerunner of the French New Wave, it’s worth a look for historical purposes alone. A must. Though that could have something to do with a personal bias. I happen to find Chabrol more fascinating than some other French directors I feel are either overrated or whose films don’t generally reward on multiple viewings (i.e., Godard, Truffaut, etc.) His work is entrenched in the mechanics of the human psyche and, yes, he usually explores and illuminates what’s unappealing. 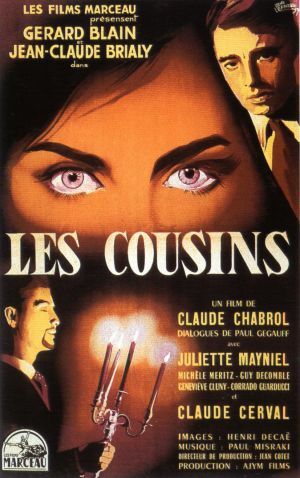 ‘Les Cousins’ appears to be a study in civilized detachment. Some of the more dissolute characters in it seem to admire the ‘country mouse’ who comes into their presence – and the interplay is most interesting in its non-verbal aspect. For me, the cumulative effect during the stunning and tragic finale remains powerful each time I see the film.